Adopted as a child, Chloe discovers she's the last living descendant of the Thomas lineage and inherits the family house. Although in need of renovation, it's worth a fortune. While searching through its contents, she finds a box containing personal family items and immediately feels a strong connection to the people who once owned them. This was a genuinely enjoyable read. The author certainly knows how to write a good, character-driven story. The family history unfolds through flashbacks centered around the items in the box discovered by Chloe; and what a tangled, tragic and absorbing history it is! By the end, I felt as though I'd been a privileged witness to madness. 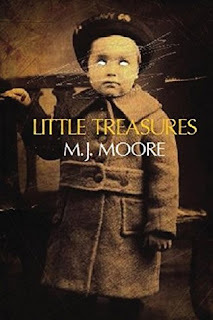 My thanks to author M.J. Moore for providing a copy of this book.